Apparently this weekend's viewings have largely turned in to studying fan mentality as seen through the eyes of film-makers. 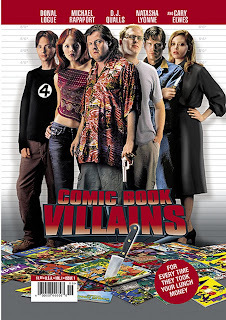 I took some time today to see Comic Book Villains, a story about two rival comic shops and their attempt to cash in on a big collection from an old woman who didn't really know what she had. There are any number of ways I can enjoy or appreciate a story. I might find the story weak, but can be impressed by the special effects. Maybe I think the director isn't any good, but the actors do an outstanding job. Maybe everything about the story is mediocre, but I just happened to be with a bunch of good friends when I read/heard/saw it and we had such a great time that it doesn't really matter what the actual story was about. I'll give you a few examples... Young Guns. I don't really recall the movie particularly well; I don't recall it being that spectacular certainly. But I saw it with a good group of friends back in high school, and we had a great time. The Philadelphia Story. I came home from work several years ago and my ex-wife was watching it. I had no idea what was going on or what the story was about, but I happened to walk in when there was a scene between Katherine Hepburn, Cary Grant and James Stewart. The three of them were doing such an amazing job that I literally froze there, awestruck at their performance until the scene ended. Ratatouille. I thought the story was a bit predictable, and didn't find much to emotionally attach myself to any of the characters, but damn, they did an incredible job with the animation. I'm still impressed by how great the wet rat hair looked. Now I bring this up as a means to emphasize that a movie can be good for any number of reasons. Quentin Tarantino's movies, for example, I don't generally care for. I often think the characters don't make sense, and the plots tend to be a little weak. However, I do appreciate his cinematic eye as a director and find that he uses the medium of film to great effect. He's able to utilize all of the best elements of film to tell whatever story he's trying to tell. I just happen to not like those stories. Which brings me back to Comic Book Villains. As far as I can tell, Tarantino had no direct impact on this movie. However, it feels like writer/director James Robinson was trying to make a Tarantino-style movie. It has that element of things spiraling out of control as the characters become more and more entrenched in their own single-minded pursuits. Except for Archie. Portrayed by D.J. Qualls, the character of Archie is provided largely as an anchor for the audience. He's the "normal" guy with whom the viewer is supposed to, I suspect, identify with. And while that's something I often finding lacking in Tarantino's work, it's not effective here. Archie does very little in the actual story, other than acting as the narrator. He's there to bear witness to many of the events, but nothing more. The inclusion and occasional referencing of the Conan character, played by Danny Masterson, doesn't seem to warrant focus either. He's introduced very early as a seemingly Machiavellian villain, but then disappears throughout most of the story. He pops up briefly in the middle to become a "double-agent" of sorts for the rival comic book shop, but he provides exactly one piece of information before disappearing again until the epilogue. Comic Book Villains wasn't a bad movie, but it's not a particularly good one either. And it certainly wasn't very flattering to comic book fans.